Electrons in bilayer graphene are heated by a beam of light. Illustration by Loretta Kuo and Michelle Groce, University of Maryland . By using bilayer graphene, researchers at the University of Maryland developed a new type of hot electron bolometer, which is expected to be sensitive to a broad range of light energies, ranging from terahertz frequencies or submillimeter waves through the infrared to visible light. College Park, Maryland — Researchers at the Center for Nanophysics and Advanced Materials of the University of Maryland have developed a new type of hot electron bolometer, a sensitive detector of infrared light, that can be used in a huge range of applications from detection of chemical and biochemical weapons from a distance and use in security imaging technologies such as airport body scanners, to chemical analysis in the laboratory and studying the structure of the universe through improved telescopes. The UMD researchers, led by Research Associate Jun Yan and Professors Michael Fuhrer and Dennis Drew, developed the bolometer using bilayer graphene–two atomic-thickness sheets of carbon. Due to graphene’s unique properties, the bolometer is expected to be sensitive to a very broad range of light energies, ranging from terahertz frequencies or submillimeter waves through the infrared to visible light. The graphene hot electron bolometer is particularly promising as a fast, sensitive, and low-noise detector of submillimeter waves, which are particularly difficult to detect. Because these photons are emitted by relatively cool interstellar molecules, submillimeter astronomy studies the early stages of formation of stars and galaxies by observing these interstellar clouds of molecules. Sensitive detectors of submillimeter waves are being sought for new observatories that will determine the redshifts and masses of very distant young galaxies and enable studies of dark energy and the development of structure in the universe. The Maryland team’s findings are published in the June 3 issue of Nature Nanotechnology. Most photon detectors are based on semiconductors. Semiconductors are materials which have a range of energies that their electrons are forbidden to occupy, called a band gap. The electrons in a semiconductor can absorb photons of light having energies greater than the band gap energy, and this property forms the basis of devices such as photovoltaic cells. Graphene, a single atom-thick plane of graphite, is unique in that is has a bandgap of exactly zero energy; graphene can therefore absorb photons of any energy. This property makes graphene particularly attractive for absorbing very low energy photons (terahertz and infrared) which pass through most semiconductors. Graphene has another attractive property as a photon absorber: the electrons which absorb the energy are able to retain it efficiently, rather than losing energy to vibrations of the atoms of the material. This same property also leads to extremely low electrical resistance in graphene. University of Maryland researchers exploited these two properties to devise the hot electron bolometer. It works by measuring the change in the resistance that results from the heating of the electrons as they absorb light. Normally, graphene’s resistance is almost independent of temperature, unsuitable for a bolometer. So the Maryland researchers used a special trick: when bilayer graphene is exposed to an electric field it has a small band gap, large enough that its resistance becomes strongly temperature dependent, but small enough to maintain its ability to absorb low energy infrared photons. The researchers found that their bilayer graphene hot electron bolometer operating at a temperature of 5 Kelvin had comparable sensitivity to existing bolometers operating at similar temperatures, but was more than a thousand times faster. They extrapolated the performance of the graphene bolometer to lower temperature and found that it may beat all existing technologies. Some challenges remain. The bilayer graphene bolometer has a higher electrical resistance than similar devices using other materials which may make it difficult to use at high frequencies. 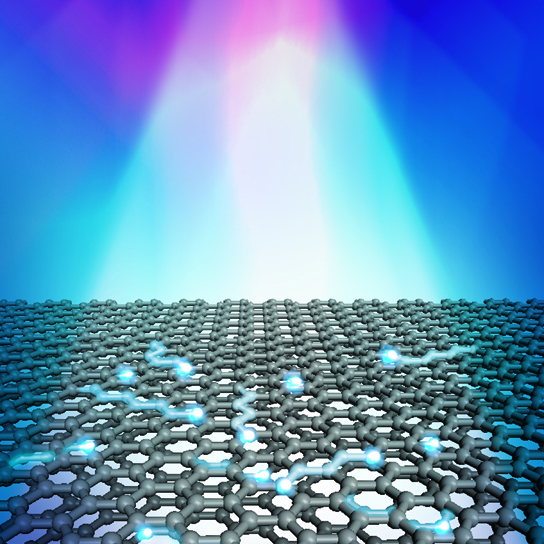 Additionally, bilayer graphene absorbs only a few percent of incident light. But the Maryland researchers are working on ways to get around these difficulties with new device designs, and are confident that a graphene has a bright future as a photodetecting material. 1 Comment on "Graphene Hot Electron Bolometer May Outperform Existing Technologies"
Using ALD and forming the graphene into shapes that will collect at differing frequencies, similar to the way and ear captures and reads sound. Shape is very important.